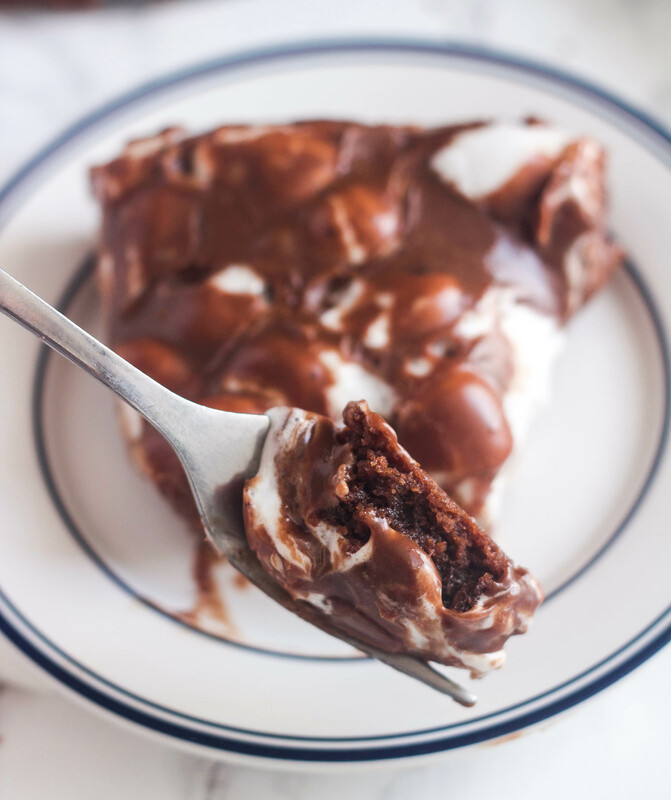 Mississippi Mud Brownie Pie is a decadent and ridiculously delicious dessert that is going to knock your socks off. 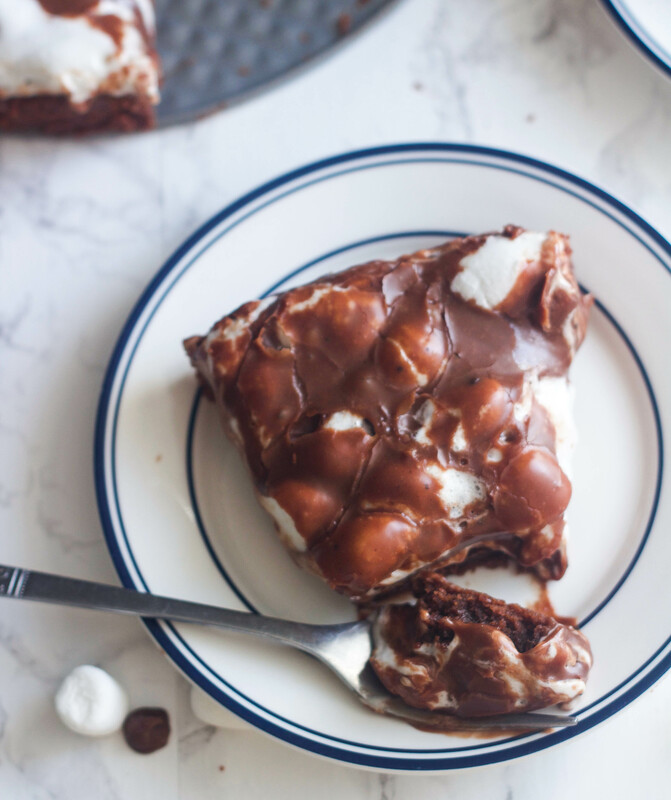 If you’re a chocoholic like me, then you are going to love this! Valentine’s Day is just three days away and if you’re looking for a rich, decadent and insanely good dessert to make for your sweetheart, your kids or even yourself, then you’ve come to the right place. 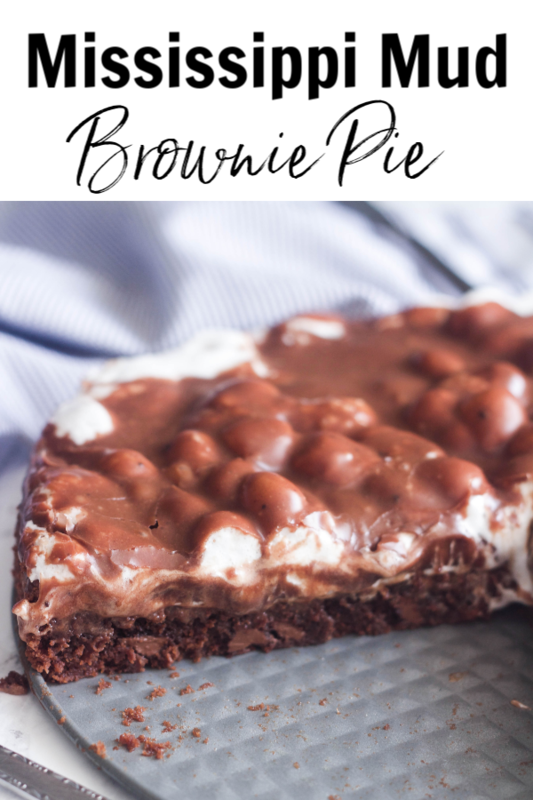 This Mississippi Mud Brownie Pie is divine, simple to make, and is sure to please all chocolate lovers out there. This is one of those desserts that I could have easily gone and hid in a closet and devoured the entire thing myself and not shared even one little bite with my boys. But since I’m such a nice mom (haha), I decided to share and let them enjoy some of this too. If I had this sitting on my kitchen counter right now, it’s most likely what I would be eating for breakfast, so it’s a probably a good thing I don’t. 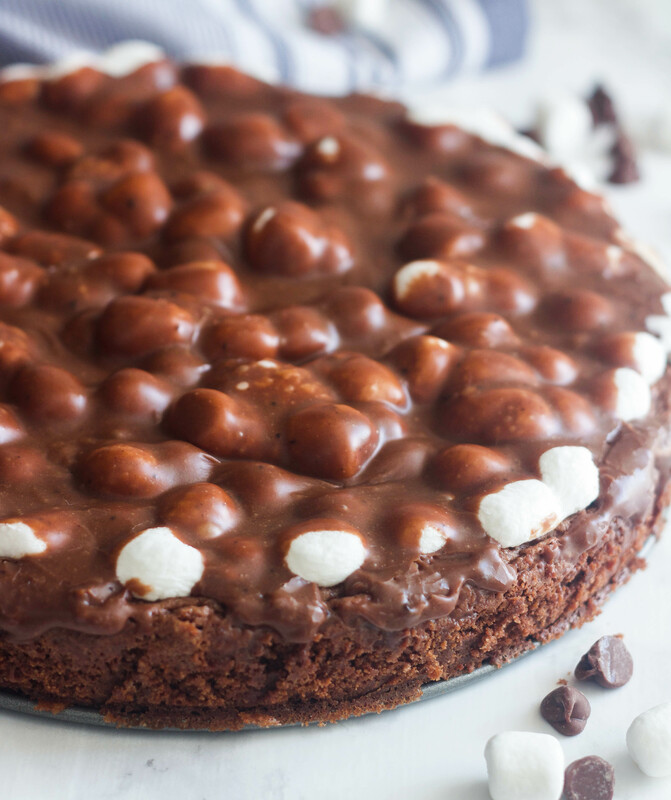 This Mississippi Mud Fudge Pie starts with a fudgy, brownie-like base sprinkled with chocolate chips and then baked just the perfect amount of time to keep it dense, moist and fudgy. 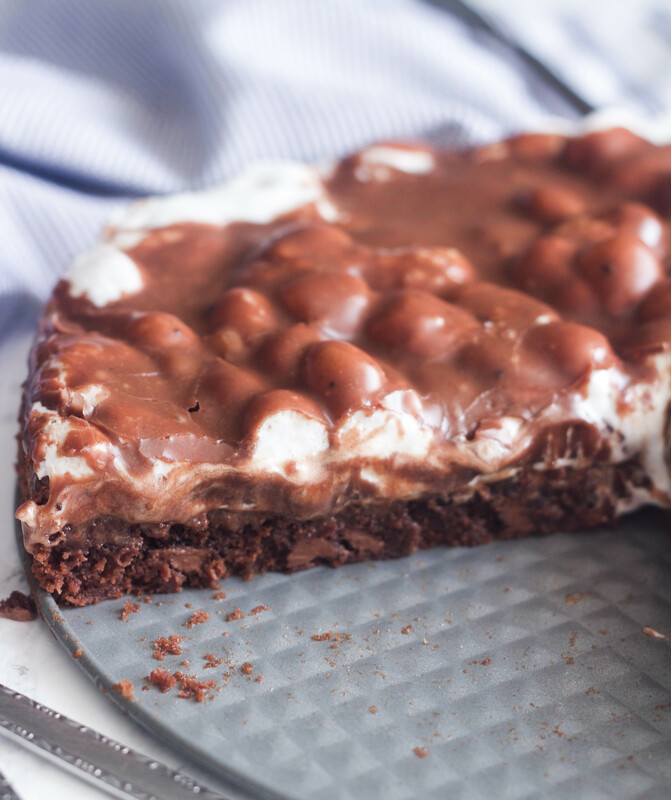 Then it’s topped with marshmallows and put back in the oven just long enough for those mini marshmallows to puff up. Then the most delicious chocolate glaze/frosting is poured on top. Then the hardest part comes which is waiting for it to cool enough to start digging in. It’s heaven! I’m thinking maybe I should give this another “trial run” before Valentine’s Day. You know, maybe make it again today just to be sure it’s what I want for our dessert on Thursday. I can absolutely guarantee my boys would be ecstatic when they got home today. This really is the perfect dessert! Preheat the oven to 350 degrees. Spray a 9-inch spring form with cooking spray. Set aside. In a medium bowl, whisk together the melted butter and cocoa. Add the eggs and mix until just combined. Add the flour, sugar, baking powder, salt and vanilla and mix well. (You can use a hand mixer for this or mix it by hand). Pour into the prepared pan and sprinkle with chocolate chips. Bake on a middle shelf of the oven for 25 to 30 minutes, or until a toothpick inserted in the center comes out clean. Immediately sprinkle the marshmallows on top and return to the oven for a few minutes to melt the marshmallows. Remove from the oven and let cool just about 2 to 3 minutes then carefully spread the chocolate frosting over top. Let cool then run knife around the inside of the springform pan before releasing and removing the outer side of the pan. Cut into wedges and serve. Combine all ingredients together in a medium bowl and mix on medium low speed with a hand mixer, until smooth. Pour over marshmallow layer and carefully spread evenly. Well, I had my sights on making your M & M cookies as I didn’t have any evaporated milk in the house. However, when I went in the basement I spied some evaporated milk leftover from my Christmas stash and was able to make these for our dessert tonight. They are AWESOME! So, so good! I purchased a nice 9” springform pan last year and I am glad it will get more use. Thanks so much for posting this fabulous dessert! I will be making the M & M cookies later this week! Hey Linda, so happy to hear you made the Mississippi Mud Brownie Pie. We are all in love with it! Thank goodness for your Christmas stash (lol!). Have a great weekend.